Pioneers in the industry, we offer leather punching machine from India. We feel immensely pleased to offer an exclusive gamut of Leather Punching Machine. Our offered range is manufactured by using quality proven raw material and latest technology at our end. These exclusively designed leather punches are widely acclaimed for sturdy construction, compact size and long functional life. 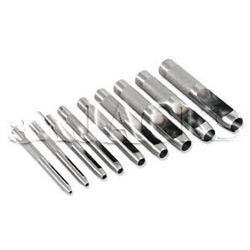 In order to ensure quality, these punches are scrupulously tested on several parameters. In tune with international standard, we provide the entire range in several sizes and designs, as per the ever-evolving requirement of our clients.